Jamaica is not all about reggae but of course it’s a great part of it. There are lots of places to go in Jamaica and what make it a great place to visit is its people. They are such a fun group of people and you’ll surely meet new friends here. In Jamaica you’ll enjoy their beautiful island paradise and it’s flocked with tourists not just this century but for many centuries! Here you’ll see the most beautiful sunset as it sparks from the sky and is reflected by its crystal clear water and white sandy beach. Jamaica used to be visited by the privileged before but now you don’t need to be rich and mighty to enjoy Jamaica. The north and west coastlines of the island is flocked by tourists with accommodating yet not so expensive resorts and hotels. You might think that Jamaica can’t possibly cope up with the millions of tourists but it does. It did not spoil Jamaica despite its commercialization. After all, that’s what people came here for and if they can’t maintain the beauty of the island then people would stop coming and jobs would be scarce. Unfortunately, the people living in such a rich island are mostly really poor. Without the tourists, most of them would just starve as they have been dependent on these tourists. It’s a good thing that they get their income from their tourism but it can be irritating to the tourists sometimes. Locals can get pushy especially the vendors. And also, there are illegal taxi cabs with no license and tourists usually hate it when drivers insist that they ride with him. There are some crimes too so better keep your valuables safe from those hungry hands. 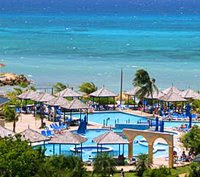 Actually it is not a bad idea a holiday to Jamaica, thank you. I should include it on my holiday agenda whenever I need to chill out in the sunshine.